Coach Robbie Blake was pleased to see the Rocks reach the next round of the FA Trophy by beating Bracknell on penalties at the end of a dramatic night. 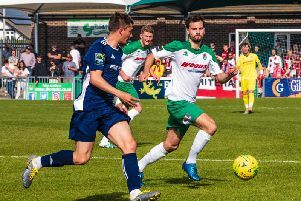 The former Bradford, Burnley and Leeds striker was not happy with Bognor's slow start, nor with the huge number of chances they missed that could have avoided the need for extra-time and spot kicks. But he praised their character in coming back from two goals down to stay in the competition and net £3,250 prize money. See his full post-match interview above.